You don't need a lot of health books to learn how to take care of yourself. You'll spend a lot of money and time to get really confused and they will take up space in your house. Trust me. I've done it. 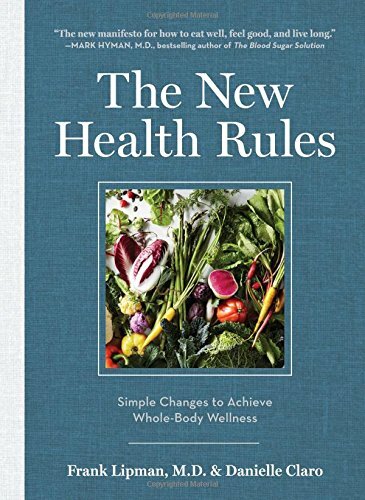 But here's one little book you need to get: The New Health Rules - Simple Changes to Achieve Whole-Body Wellness by Dr. Frank Lipman, M.D. & Danielle Claro. The rules are simple and actionable. Everything from "if you eat cows, make sure they eat grass" to "olive oil in salad is better than olive oil in cooking". And it's not all about food. Moving, Boosting, Healing and Living are covered as well. What are Omega 3s and why do they matter? "Omega-3s are healthy fats your body needs: They lower your cholesterol and your blood pressure; strengthen your immune system; boost the health of your brain, joints, heart and eyes; and reduce inflammation (which is connected with all sorts of diseases). Great sources are wild salmon, walnuts, grass-fed meat, ground flaxseeds, and sardines." Boom. That's all we need to know. Thank you. This is the book I wish I wrote. But now I don't have to. Thank you Dr. Lipman. I will continue to share pearls with you to convince you to buy it for yourself, your mother, your friends and your kids. And don't worry about shelf space. It's compact, just 5" x 7" and half of it is compelling photography. Newer PostThe Power of Three - 3 Proteins + 3 Veg = Meals for 3 Days.